Ria Loves Pawlish: Participate In Sation's Salon Shout-out and Win! hey, everyone! 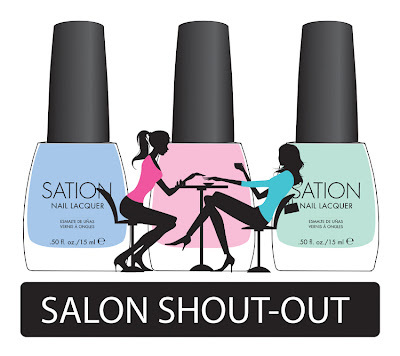 i'm super excited to bring the info about Sation's Salon Shout-out to you all. to celebrate reaching over 2000 subscribers on Facebook and the launch of new Miss Professional Nail products, Sation is having a giveaway! in order to expand to different retailers and make their products more accessible to everyone, Sation wants to hear your suggestions of salons in your area of the US that would be a great match for carrying Miss Professional Nail products. find out how to enter and what you can win in the official press release below! All participants who provide salon referrals will be entered into a raffle to receive Miss’ complete ‘Candylandia’collection. We’ll be randomly selecting three winners. All participating bloggers will receive a six-pack of Sation for their support. If three salons pick up Sation as a result of your followers’ referrals, you will receive a complete set of all Miss 2013 Collections. Salons that pick up Sation will receive massive exposure via our social media sites and marketing channels.